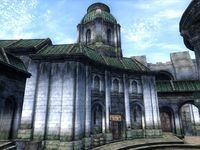 The Tiber Septim Hotel is the most expensive and luxurious hotel in the Imperial City; located in the Talos Plaza District. It is found in the District's center plaza, across the street from Umbacano Manor and next to Sevarius Atius' House. The publican, Augusta Calidia, buys potions and food while only selling the latter. The ground floor of the inn is spacious and elegant. It contains the main reception area, which consists of a counter, a series of dining and working tables, and Augusta's bed, which you can't sleep in. The rooms can be found upstairs. The second floor of the hotel is divided into two sections: a dining room containing one large and two smaller tables and the rooms rented by the other occupants. Specifically, there are four rooms: three singles and a double. The double and one of the singles are occupied by Faelian and Atraena, and Gwinas respectively. The room that you can rent is the single closest to the dining room and contains a bed, a chest, and a cupboard. It is not possible to sleep in any of the other rooms. Augusta's study can be accessed from the dining room and contains a desk and a table. The Lonely Wanderer: A High Elf in the Imperial City must be removed from existence. The Tiber Septim Hotel lobby's cell is the game's "safe zone" to prevent crashes/bugs if a creature, NPC, or even the player is in a cell added by a mod and the mod is removed. Any actors whose cell has disappeared will be placed in the hotel's lobby. 2AEEA is the form ID of the Tiber Septim lobby cell; this can be changed to any desired cell's form ID. There are many valuable items in the second floor dining room that can be easily fenced since the room is usually empty. The Thieves Guild Fence Fathis Ules can be found here eating and conducting his business every evening. The dining tables and chairs in the second floor dining room appear to be floating just above the ground instead of resting on it. This page was last modified on 8 July 2018, at 16:50.